This is the one that started me on the Ebony on Ebony craze! Perfect execution like all Haleys. When I was starting up the website back in 2004/2005 I was looking for some new cuemakers to deal with. I spoke to paul Drexler and the first name he mentioned was Ron Haley. I had heard of him and had seen a few of his cue online, but never in person. I called Ron and after speaking to him I knew I had to have one of his cues. I asked him to build this fairly simple (in theory) design. He agreed and about 9 months later I had this cue. Now his wait time is like 9 years or something crazy like that. 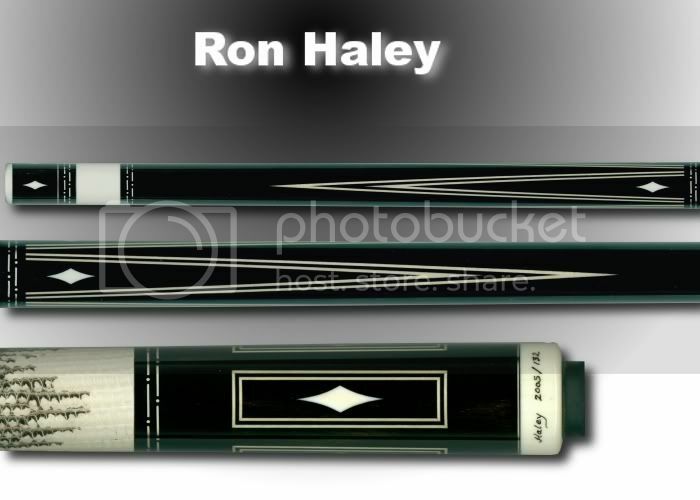 This simple design was brought to life by Ron with the most flawless execution I had ever seen in a cue. By flawless I mean...FLAWLESS. Razor sharp dead even points, perfectly mitered boxes, sharp inlays, and of course the signature Haley rings. I love this cue! WOW, I luv this cue. The black & white make each other pop!